In the first module of Dr. Jay Wile’s homeschooling textbook, Exploring Creation with General Science , Wile laid the foundation for doubting scientific claims. In the second module he launches a full assault on science. In sections titled “What Science is NOT,” and “Failures of the Scientific Method,” and ”The Limitations of Science” Wile rephrases his main point: “no matter what you might hear or read, science has never and can never prove anything!” or “science is not 100% reliable and cannot prove anything.” Wile combines a perfectly reasonable claim about the fallibility of humans who engage in science with a not-so-subtle straw man argument to convince students to doubt all scientific knowledge. Along the way he cherry picks particular episodes from the history of science to support his skeptical position. Wile tries to inculcate a particular form of profound skepticism, at least when applied to scientific results. Science, he tells his readers, does not have a method for proving anything. By prove, Wile means to establish as Truth for eternity. As his previous module on the history of science indicated, even the most well-established scientific knowledge has been disproven. Therefore, a “single counter-example is enough to destroy a conclusion,” any scientific conclusion. And the fact that he was proven wrong demonstrates why we should trust the scientific method but doubt the findings of science. …it might be interesting to not that the Old Testament contains meticulous instructions concerning how a priest is to cleanse himself after touching a dead body. These rituals, some of which are laid out in Numbers 19, are more effective than all but the most modern methods of sterilization. … This, of course, should not surprise you. After all, God knows all about germs and bacteria; He created them. Thus, it only makes sense that He would lay down instruction as to how His people can protect themselves from germs and bacteria. As with any other field, the only way to truly understand where we are in science today is to look at what happened in the past. The history of science can teach us many lessons about how science should and should not be practiced. It can also help us understand the direction in which science is heading today. In the end, then, no one should undertake a serious study of science without first taking a look at its history. That’s where we will start in the course. This module will provide you with a brief history of human scientific inquiry. If you do not like history, please stick with this module. You will start to sink your teeth into science in the next module. Without a historical perspective, however, you will not fully appreciate what science is! Science is a human activity. Science has a past that can help us understand how humans have engaged in this activity. If you want a better understanding of current science, you should study how people in the past practiced it. Sounds fine so far, especially for a middle school general science textbook. Unfortunately, the brief history of science that follows has less to do with understanding science in the past than with laying the groundwork for doubting science in the present. first, scientific claims, in the end, turn out to be wrong. second, scientists often judge scientific claims by the reputation of the scientist rather than the evidence. finally, “science and Christianity work very well together,” despite what most people today think. The history of science teaches us to doubt scientific conclusions, which are regularly disproven. Wile judges science in the past and the people who investigated the natural world by “what we now know” (a turn of phrase that recurs frequently). Unsurprisingly, all past science is wrong. In his bog-standard survey, Wile finds Anaximenes foolish enough to think that air was the basic building block for all things; Democritus was wrong about atoms being indivisible and the smallest building block of matter; Aristotle was silly enough to believe in spontaneous generation; Ptolemy wrongly thought the earth was the center of the universe. In his romp through the “Dark Ages,” Wile finds devout Christian thinkers like Robert Grosseteste or Roger Bacon wrong, but at least progressively so. Copernicus, Kepler, Galileo, Newton, and Boyle are less wrong, because “we now know” that some of their conclusions are correct. believed that all life began in the sea, and at one time, humans were actually some sort of fish. This idea was later resurrected by other scientists, most notably Charles Darwin, and is today called the “theory of evolution.” Later on in this course, I will discuss this theory, showing its scientific flaws (p. 4). And Charles Lyell and Charles Darwin of course. That we continue to modify and reject scientific conclusions is, at best, a banal truism that has nothing to do with right or wrong. Only by approaching science as a timeless activity that we should evaluate by “what we now know” can Wile enlist this truism in his argument against science. Wile is not alone in judging the past by “what we now know.” See Gordon Wood’s recent review, The Bleeding Founders. Like triumphalist historians of medicine and science, Wile enlists the history of science in his particular project, his just happens to be a religio-political project. Aristotle was respected! You see, Aristotle was considered (rightly so) to be the greatest scientist of his time. Thus, his ideas (even the wrong ones) were revered for generations! In fact, the absurd notion of spontaneous generation lasted until 1870, more than 2,000 years after it was proposed by Aristotle (p. 9). So this little episode from history shows us another way that science should not be done. You should not hold fast to an idea simply because it fits with your preconceived notions. Science is built on data, not a person’s beliefs. The acceptance or rejection of a scientific proposition, then, should rest solely on the data, nothing more (p. 11–12). Wile refuses to look for evidence that might have supported a theory—e.g., Ptolemy’s geocentric system was grounded in empirical evidence and good philosophical arguments. But “we now know” it was wrong, and scientists wrongly claimed it was right, therefore we can’t trust what they say. They have succumbed to arguments from authority or their prejudicial beliefs. Scientists must be distrusted, or so Wile implies. Finally, the history of science shows us that science and Christianity go hand-in-hand, or so Wile claims. In a concerted display of faulty logic, Wile claims that because scientists in the past were Christians, Christianity is essential to the advancement of science. He lambasts Enlightenment thinkers for rejecting the Bible, despite “the fact that a Biblical worldview had brought about great advances in science….” In his survey of medieval thinkers, he never missed a chance to point out that one was a Roman Catholic priest, another a bishop in the Roman Catholic church, and yet another a devout Roman Catholic. Early modern thinkers become devout Christians. Before I end this section, I want to make sure that you have picked up on something. Notice that each of the great scientists of this era were devout Christians. In fact, … you will notice that, with a few notable exceptions, most of the great scientists from the Dark Ages to modern times were devoted Christians. Once again, that’s because the Christian worldview is a perfect fit with science (p. 18). Non-Christian scientists today continue to propagate a myth about the opposition between science and religion—apparently this is another reason not to trust scientists. The faintest scintilla of validity flash in the depths of Wile’s claims, which makes them all the more troubling. It’s easy to imagine 7th-grade students and their homeschooling parents following Wile’s logic to its intended conclusion: If scientists have modified and rejected scientific claims, and if scientists have been known to adhere to scientific theories for non-scientific reasons, and if non-Christain scientists today repeat a myth about science’s war with religion, then science and scientists (at least non-Christian scientists) are not to be trusted. He will make his point explicit in the next section. Just as Wile’s section on the history of science opens with a reasonable claim and ends in lunacy, so too do many of his paragraphs. Numerous times I find myself saying, “Okay, that’s not bad.” only then to find myself shaking my head in disbelief. I want to condemn Wile for intentionally misleading his readers—this book is, after all, more about indoctrination than education—but I can’t tell if he believes what he writes. Maybe he is the first victim of his own delusion. Maybe it doesn’t matter. 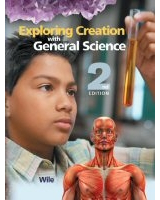 Either way, students are not learning “general science” from this textbook.